Ben Webster starred in two of the all-time great big bands and played beautiful ballads and hard-driving swing. 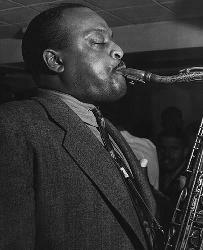 Ben Webster (March 27, 1909 - September 20, 1973) was born in Kansas City, Missouri. He studied violin and piano when young and worked as a piano player before taking up tenor saxophone in 1930. He played in Benny Moten's famous band in 1932. In 1934 he moved to New York. Coleman Hawkins had left Fletcher Henderson's Orchestra in 1934 and Lester Young had replaced Hawk. But Henderson's band members forced the leader to let Young go because Young played a very different style than Hawkins. Webster played a similar style to Hawkins and stepped into the role of star tenor in the Henderson Orchestra. After 1934, he played with several bands including Duke Ellington before joining Duke Ellington full-time in 1939 and playing continuously with Ellington until '43 and occasionally after that. Duke Ellington had not had a real star on tenor sax before him. In Ellington's band, his style matured. He played ballads with a lush, warm vibrato and style reminiscent of Benny Carter and Johnny Hodges on alto. He growled his way through up-tempo numbers with lots of rhythmic momentum. Many think this was Duke Ellington's greatest band. He was so important to it that this Ellington band is referred to as the "Blanton/Webster" band. After 1943, he played around New York City with many others and also toured with Jazz at the Philharmonic. In 1953 he recorded the classic "King of the Tenors" with Oscar Peterson. He made more classic recordings with Art Tatum for Norman Granz. He moved to Copenhagen, Denmark in 1964 and lived there for the final nine years of his life. His warm lush ballad playing, and his major contribution to Duke Ellington's greatest band qualify him as a giant in saxophone history.